These highlights do not include all the information needed to use ONGLYZA safely and effectively. See full prescribing information for ONGLYZA. ONGLYZA should not be used for the treatment of type 1 diabetes mellitus or diabetic ketoacidosis, as it would not be effective in these settings. The recommended dose of ONGLYZA is 2.5 mg or 5 mg once daily taken regardless of meals. ONGLYZA tablets must not be split or cut. No dosage adjustment for ONGLYZA is recommended for patients with mild renal impairment (creatinine clearance [CrCl] >50 mL/min). The dose of ONGLYZA is 2.5 mg once daily for patients with moderate or severe renal impairment, or with end-stage renal disease (ESRD) requiring hemodialysis (creatinine clearance [CrCl] â‰¤50 mL/min) [see Clinical Pharmacology (12.3) and Clinical Studies (14.3)]. ONGLYZA should be administered following hemodialysis. ONGLYZA has not been studied in patients undergoing peritoneal dialysis. ONGLYZA (saxagliptin) 5 mg tablets are pink, biconvex, round, film-coated tablets with â€œ5â€ printed on one side and â€œ4215â€ printed on the reverse side, in blue ink. ONGLYZA (saxagliptin) 2.5 mg tablets are pale yellow to light yellow, biconvex, round, film-coated tablets with â€œ2.5â€ printed on one side and â€œ4214â€ printed on the reverse side, in blue ink. There have been postmarketing reports of acute pancreatitis in patients taking ONGLYZA. After initiation of ONGLYZA, patients should be observed carefully for signs and symptoms of pancreatitis. If pancreatitis is suspected, ONGLYZA should promptly be discontinued and appropriate management should be initiated. It is unknown whether patients with a history of pancreatitis are at increased risk for the development of pancreatitis while using ONGLYZA. Use caution in a patient with a history of angioedema to another dipeptidyl peptidase-4 (DPP4) inhibitor because it is unknown whether such patients will be predisposed to angioedema with ONGLYZA. There have been no clinical studies establishing conclusive evidence of macrovascular risk reduction with ONGLYZA or any other antidiabetic drug. In two placebo-controlled monotherapy trials of 24-weeks duration, patients were treated with ONGLYZA 2.5 mg daily, ONGLYZA 5 mg daily, and placebo. Three 24-week, placebo-controlled, add-on combination therapy trials were also conducted: one with metformin, one with a thiazolidinedione (pioglitazone or rosiglitazone), and one with glyburide. In these three trials, patients were randomized to add-on therapy with ONGLYZA 2.5 mg daily, ONGLYZA 5 mg daily, or placebo. A saxagliptin 10 mg treatment arm was included in one of the monotherapy trials and in the add-on combination trial with metformin. In a prespecified pooled analysis of the 24-week data (regardless of glycemic rescue) from the two monotherapy trials, the add-on to metformin trial, the add-on to thiazolidinedione (TZD) trial, and the add-on to glyburide trial, the overall incidence of adverse events in patients treated with ONGLYZA 2.5 mg and ONGLYZA 5 mg was similar to placebo (72.0% and 72.2% versus 70.6%, respectively). Discontinuation of therapy due to adverse events occurred in 2.2%, 3.3%, and 1.8% of patients receiving ONGLYZA 2.5 mg, ONGLYZA 5 mg, and placebo, respectively. The most common adverse events (reported in at least 2 patients treated with ONGLYZA 2.5 mg or at least 2 patients treated with ONGLYZA 5 mg) associated with premature discontinuation of therapy included lymphopenia (0.1% and 0.5% versus 0%, respectively), rash (0.2% and 0.3% versus 0.3%), blood creatinine increased (0.3% and 0% versus 0%), and blood creatine phosphokinase increased (0.1% and 0.2% versus 0%). The adverse reactions in this pooled analysis reported (regardless of investigator assessment of causality) in â‰¥5% of patients treated with ONGLYZA 5 mg, and more commonly than in patients treated with placebo are shown in Table 1. * The 5 placebo-controlled trials include two monotherapy trials and one add-on combination therapy trial with each of the following: metformin, thiazolidinedione, or glyburide. Table shows 24-week data regardless of glycemic rescue. In patients treated with ONGLYZA 2.5 mg, headache (6.5%) was the only adverse reaction reported at a rate â‰¥5% and more commonly than in patients treated with placebo. In this pooled analysis, adverse reactions that were reported in â‰¥2% of patients treated with ONGLYZA 2.5 mg or ONGLYZA 5 mg and â‰¥1% more frequently compared to placebo included: sinusitis (2.9% and 2.6% versus 1.6%, respectively), abdominal pain (2.4% and 1.7% versus 0.5%), gastroenteritis (1.9% and 2.3% versus 0.9%), and vomiting (2.2% and 2.3% versus 1.3%). In the add-on to TZD trial, the incidence of peripheral edema was higher for ONGLYZA 5 mg versus placebo (8.1% and 4.3%, respectively). The incidence of peripheral edema for ONGLYZA 2.5 mg was 3.1%. None of the reported adverse reactions of peripheral edema resulted in study drug discontinuation. Rates of peripheral edema for ONGLYZA 2.5 mg and ONGLYZA 5 mg versus placebo were 3.6% and 2% versus 3% given as monotherapy, 2.1% and 2.1% versus 2.2% given as add-on therapy to metformin, and 2.4% and 1.2% versus 2.2% given as add-on therapy to glyburide. The incidence rate of fractures was 1.0 and 0.6 per 100 patient-years, respectively, for ONGLYZA (pooled analysis of 2.5 mg, 5 mg, and 10 mg) and placebo. The incidence rate of fracture events in patients who received ONGLYZA did not increase over time. Causality has not been established and nonclinical studies have not demonstrated adverse effects of saxagliptin on bone. An event of thrombocytopenia, consistent with a diagnosis of idiopathic thrombocytopenic purpura, was observed in the clinical program. The relationship of this event to ONGLYZA is not known. ONGLYZA 2.5 mg was compared to placebo in a 12-week trial in 170 patients with type 2 diabetes and moderate or severe renal impairment or end-stage renal disease (ESRD). The incidence of adverse events, including serious adverse events and discontinuations due to adverse events, was similar between ONGLYZA and placebo. In the add-on to insulin trial [see Clinical Studies (14.2)], the incidence of adverse events, including serious adverse events and discontinuations due to adverse events, was similar between ONGLYZA and placebo, except for confirmed hypoglycemia (see Hypoglycemia subsection). Table 2 shows the adverse reactions reported (regardless of investigator assessment of causality) in â‰¥5% of patients participating in an additional 24-week, active-controlled trial of coadministered ONGLYZA and metformin in treatment-naive patients. * Metformin was initiated at a starting dose of 500 mg daily and titrated up to a maximum of 2000 mg daily. Adverse reactions of hypoglycemia were based on all reports of hypoglycemia. A concurrent glucose measurement was not required or was normal in some patients. Therefore, it is not possible to conclusively determine that all these reports reflect true hypoglycemia. In the add-on to glyburide study, the overall incidence of reported hypoglycemia was higher for ONGLYZA 2.5 mg and ONGLYZA 5 mg (13.3% and 14.6%) versus placebo (10.1%). The incidence of confirmed hypoglycemia in this study, defined as symptoms of hypoglycemia accompanied by a fingerstick glucose value of â‰¤50 mg/dL, was 2.4% and 0.8% for ONGLYZA 2.5 mg and ONGLYZA 5 mg and 0.7% for placebo [see Warnings and Precautions (5.2)]. The incidence of reported hypoglycemia for ONGLYZA 2.5 mg and ONGLYZA 5 mg versus placebo given as monotherapy was 4.0% and 5.6% versus 4.1%, respectively, 7.8% and 5.8% versus 5% given as add-on therapy to metformin, and 4.1% and 2.7% versus 3.8% given as add-on therapy to TZD. The incidence of reported hypoglycemia was 3.4% in treatment-naive patients given ONGLYZA 5 mg plus metformin and 4.0% in patients given metformin alone. In the active-controlled trial comparing add-on therapy with ONGLYZA 5 mg to glipizide in patients inadequately controlled on metformin alone, the incidence of reported hypoglycemia was 3% (19 events in 13 patients) with ONGLYZA 5 mg versus 36.3% (750 events in 156 patients) with glipizide. Confirmed symptomatic hypoglycemia (accompanying fingerstick blood glucose â‰¤50 mg/dL) was reported in none of the ONGLYZA-treated patients and in 35 glipizide-treated patients (8.1%) (p<0.0001). During 12 weeks of treatment in patients with moderate or severe renal impairment or ESRD, the overall incidence of reported hypoglycemia was 20% among patients treated with ONGLYZA 2.5 mg and 22% among patients treated with placebo. Four ONGLYZA-treated patients (4.7%) and three placebo-treated patients (3.5%) reported at least one episode of confirmed symptomatic hypoglycemia (accompanying fingerstick glucose â‰¤50 mg/dL). In the add-on to insulin trial, the overall incidence of reported hypoglycemia was 18.4% for ONGLYZA 5 mg and 19.9% for placebo. However, the incidence of confirmed symptomatic hypoglycemia (accompanying fingerstick blood glucose â‰¤50 mg/dL) was higher with ONGLYZA 5 mg (5.3%) versus placebo (3.3%) [see Warnings and Precautions (5.2)]. Hypersensitivity-related events, such as urticaria and facial edema in the 5-study pooled analysis up to Week 24 were reported in 1.5%, 1.5%, and 0.4% of patients who received ONGLYZA 2.5 mg, ONGLYZA 5 mg, and placebo, respectively. None of these events in patients who received ONGLYZA required hospitalization or were reported as life-threatening by the investigators. One saxagliptin-treated patient in this pooled analysis discontinued due to generalized urticaria and facial edema. In the unblinded, controlled, clinical trial database for saxagliptin to date, there have been 6 (0.12%) reports of tuberculosis among the 4959 saxagliptin-treated patients (1.1 per 1000 patient-years) compared to no reports of tuberculosis among the 2868 comparator-treated patients. Two of these six cases were confirmed with laboratory testing. The remaining cases had limited information or had presumptive diagnoses of tuberculosis. None of the six cases occurred in the United States or in Western Europe. One case occurred in Canada in a patient originally from Indonesia who had recently visited Indonesia. The duration of treatment with saxagliptin until report of tuberculosis ranged from 144 to 929 days. Post-treatment lymphocyte counts were consistently within the reference range for four cases. One patient had lymphopenia prior to initiation of saxagliptin that remained stable throughout saxagliptin treatment. The final patient had an isolated lymphocyte count below normal approximately four months prior to the report of tuberculosis. There have been no spontaneous reports of tuberculosis associated with saxagliptin use. Causality has not been estimated and there are too few cases to date to determine whether tuberculosis is related to saxagliptin use. There has been one case of a potential opportunistic infection in the unblinded, controlled clinical trial database to date in a saxagliptin-treated patient who developed suspected foodborne fatal salmonella sepsis after approximately 600 days of saxagliptin therapy. There have been no spontaneous reports of opportunistic infections associated with saxagliptin use. No clinically meaningful changes in vital signs have been observed in patients treated with ONGLYZA. There was a dose-related mean decrease in absolute lymphocyte count observed with ONGLYZA. From a baseline mean absolute lymphocyte count of approximately 2200 cells/microL, mean decreases of approximately 100 and 120 cells/microL with ONGLYZA 5 mg and 10 mg, respectively, relative to placebo were observed at 24 weeks in a pooled analysis of five placebo-controlled clinical studies. Similar effects were observed when ONGLYZA 5 mg was given in initial combination with metformin compared to metformin alone. There was no difference observed for ONGLYZA 2.5 mg relative to placebo. The proportion of patients who were reported to have a lymphocyte count â‰¤750 cells/microL was 0.5%, 1.5%, 1.4%, and 0.4% in the saxagliptin 2.5 mg, 5 mg, 10 mg, and placebo groups, respectively. In most patients, recurrence was not observed with repeated exposure to ONGLYZA although some patients had recurrent decreases upon rechallenge that led to discontinuation of ONGLYZA. The decreases in lymphocyte count were not associated with clinically relevant adverse reactions. The clinical significance of this decrease in lymphocyte count relative to placebo is not known. When clinically indicated, such as in settings of unusual or prolonged infection, lymphocyte count should be measured. The effect of ONGLYZA on lymphocyte counts in patients with lymphocyte abnormalities (e.g., human immunodeficiency virus) is unknown. ONGLYZA did not demonstrate a clinically meaningful or consistent effect on platelet count in the six, double-blind, controlled clinical safety and efficacy trials. Additional adverse reactions have been identified during postapproval use of ONGLYZA. Because these reactions are reported voluntarily from a population of uncertain size, it is generally not possible to reliably estimate their frequency or establish a causal relationship to drug exposure. There are no adequate and well-controlled studies in pregnant women. Because animal reproduction studies are not always predictive of human response, ONGLYZA, like other antidiabetic medications, should be used during pregnancy only if clearly needed. Saxagliptin was not teratogenic at any dose tested when administered to pregnant rats and rabbits during periods of organogenesis. Incomplete ossification of the pelvis, a form of developmental delay, occurred in rats at a dose of 240 mg/kg, or approximately 1503 and 66 times human exposure to saxagliptin and the active metabolite, respectively, at the maximum recommended human dose (MRHD) of 5 mg. Maternal toxicity and reduced fetal body weights were observed at 7986 and 328 times the human exposure at the MRHD for saxagliptin and the active metabolite, respectively. Minor skeletal variations in rabbits occurred at a maternally toxic dose of 200 mg/kg, or approximately 1432 and 992 times the MRHD. Coadministration of saxagliptin and metformin, to pregnant rats and rabbits during the period of organogenesis, was neither embryolethal nor teratogenic in either species when tested at doses yielding systemic exposures (AUC) up to 100 and 10 times the MRHD (saxagliptin 5 mg and metformin 2000 mg), respectively, in rats; and 249 and 1.1 times the MRHDs in rabbits. In rats, minor developmental toxicity was limited to an increased incidence of wavy ribs; associated maternal toxicity was limited to weight decrements of 11% to 17% over the course of the study, and related reductions in maternal food consumption. In rabbits, coadministration was poorly tolerated in a subset of mothers (12 of 30), resulting in death, moribundity, or abortion. However, among surviving mothers with evaluable litters, maternal toxicity was limited to marginal reductions in body weight over the course of gestation days 21 to 29; and associated developmental toxicity in these litters was limited to fetal body weight decrements of 7%, and a low incidence of delayed ossification of the fetal hyoid. Saxagliptin administered to female rats from gestation day 6 to lactation day 20 resulted in decreased body weights in male and female offspring only at maternally toxic doses (exposures â‰¥1629 and 53 times saxagliptin and its active metabolite at the MRHD). No functional or behavioral toxicity was observed in offspring of rats administered saxagliptin at any dose. Saxagliptin crosses the placenta into the fetus following dosing in pregnant rats. Saxagliptin is secreted in the milk of lactating rats at approximately a 1:1 ratio with plasma drug concentrations. It is not known whether saxagliptin is secreted in human milk. Because many drugs are secreted in human milk, caution should be exercised when ONGLYZA is administered to a nursing woman. Safety and effectiveness of ONGLYZA in pediatric patients have not been established. In the six, double-blind, controlled clinical safety and efficacy trials of ONGLYZA, 634 (15.3%) of the 4148 randomized patients were 65 years and over, and 59 (1.4%) patients were 75 years and over. No overall differences in safety or effectiveness were observed between patients â‰¥65 years old and the younger patients. While this clinical experience has not identified differences in responses between the elderly and younger patients, greater sensitivity of some older individuals cannot be ruled out. In a controlled clinical trial, once-daily, orally-administered ONGLYZA in healthy subjects at doses up to 400 mg daily for 2 weeks (80 times the MRHD) had no dose-related clinical adverse reactions and no clinically meaningful effect on QTc interval or heart rate. In the event of an overdose, appropriate supportive treatment should be initiated as dictated by the patientâ€™s clinical status. Saxagliptin and its active metabolite are removed by hemodialysis (23% of dose over 4 hours). Saxagliptin is an orally-active inhibitor of the DPP4 enzyme. Saxagliptin monohydrate is a white to light yellow or light brown, non-hygroscopic, crystalline powder. It is sparingly soluble in water at 24°C ± 3°C, slightly soluble in ethyl acetate, and soluble in methanol, ethanol, isopropyl alcohol, acetonitrile, acetone, and polyethylene glycol 400 (PEG 400). Each film-coated tablet of ONGLYZA for oral use contains either 2.79 mg saxagliptin hydrochloride (anhydrous) equivalent to 2.5 mg saxagliptin or 5.58 mg saxagliptin hydrochloride (anhydrous) equivalent to 5 mg saxagliptin and the following inactive ingredients: lactose monohydrate, microcrystalline cellulose, croscarmellose sodium, and magnesium stearate. In addition, the film coating contains the following inactive ingredients: polyvinyl alcohol, polyethylene glycol, titanium dioxide, talc, and iron oxides. Increased concentrations of the incretin hormones such as glucagon-like peptide-1 (GLP-1) and glucose-dependent insulinotropic polypeptide (GIP) are released into the bloodstream from the small intestine in response to meals. These hormones cause insulin release from the pancreatic beta cells in a glucose-dependent manner but are inactivated by the DPP4 enzyme within minutes. GLP-1 also lowers glucagon secretion from pancreatic alpha cells, reducing hepatic glucose production. In patients with type 2 diabetes, concentrations of GLP-1 are reduced but the insulin response to GLP-1 is preserved. Saxagliptin is a competitive DPP4 inhibitor that slows the inactivation of the incretin hormones, thereby increasing their bloodstream concentrations and reducing fasting and postprandial glucose concentrations in a glucose-dependent manner in patients with type 2 diabetes mellitus. In patients with type 2 diabetes mellitus, administration of ONGLYZA inhibits DPP4 enzyme activity for a 24-hour period. After an oral glucose load or a meal, this DPP4 inhibition resulted in a 2- to 3-fold increase in circulating levels of active GLP-1 and GIP, decreased glucagon concentrations, and increased glucose-dependent insulin secretion from pancreatic beta cells. The rise in insulin and decrease in glucagon were associated with lower fasting glucose concentrations and reduced glucose excursion following an oral glucose load or a meal. In a randomized, double-blind, placebo-controlled, 4-way crossover, active comparator study using moxifloxacin in 40 healthy subjects, ONGLYZA was not associated with clinically meaningful prolongation of the QTc interval or heart rate at daily doses up to 40 mg (8 times the MRHD). The pharmacokinetics of saxagliptin and its active metabolite, 5-hydroxy saxagliptin were similar in healthy subjects and in patients with type 2 diabetes mellitus. The Cmax and AUC values of saxagliptin and its active metabolite increased proportionally in the 2.5 to 400 mg dose range. Following a 5 mg single oral dose of saxagliptin to healthy subjects, the mean plasma AUC values for saxagliptin and its active metabolite were 78 ngh/mL and 214 ngh/mL, respectively. The corresponding plasma Cmax values were 24 ng/mL and 47 ng/mL, respectively. The average variability (%CV) for AUC and Cmax for both saxagliptin and its active metabolite was less than 25%. No appreciable accumulation of either saxagliptin or its active metabolite was observed with repeated once-daily dosing at any dose level. No dose- and time-dependence were observed in the clearance of saxagliptin and its active metabolite over 14 days of once-daily dosing with saxagliptin at doses ranging from 2.5 to 400 mg. The median time to maximum concentration (Tmax) following the 5 mg once daily dose was 2 hours for saxagliptin and 4 hours for its active metabolite. Administration with a high-fat meal resulted in an increase in Tmax of saxagliptin by approximately 20 minutes as compared to fasted conditions. There was a 27% increase in the AUC of saxagliptin when given with a meal as compared to fasted conditions. ONGLYZA may be administered with or without food. The in vitro protein binding of saxagliptin and its active metabolite in human serum is negligible. Therefore, changes in blood protein levels in various disease states (e.g., renal or hepatic impairment) are not expected to alter the disposition of saxagliptin. Saxagliptin is eliminated by both renal and hepatic pathways. Following a single 50 mg dose of 14C-saxagliptin, 24%, 36%, and 75% of the dose was excreted in the urine as saxagliptin, its active metabolite, and total radioactivity, respectively. The average renal clearance of saxagliptin (~230 mL/min) was greater than the average estimated glomerular filtration rate (~120 mL/min), suggesting some active renal excretion. A total of 22% of the administered radioactivity was recovered in feces representing the fraction of the saxagliptin dose excreted in bile and/or unabsorbed drug from the gastrointestinal tract. Following a single oral dose of ONGLYZA 5 mg to healthy subjects, the mean plasma terminal half-life (t1/2) for saxagliptin and its active metabolite was 2.5 and 3.1 hours, respectively. The degree of renal impairment did not affect the Cmax of saxagliptin or its active metabolite. In subjects with mild renal impairment, the AUC values of saxagliptin and its active metabolite were 20% and 70% higher, respectively, than AUC values in subjects with normal renal function. Because increases of this magnitude are not considered to be clinically relevant, dosage adjustment in patients with mild renal impairment is not recommended. In subjects with moderate or severe renal impairment, the AUC values of saxagliptin and its active metabolite were up to 2.1- and 4.5-fold higher, respectively, than AUC values in subjects with normal renal function. To achieve plasma exposures of saxagliptin and its active metabolite similar to those in patients with normal renal function, the recommended dose is 2.5 mg once daily in patients with moderate and severe renal impairment, as well as in patients with end-stage renal disease requiring hemodialysis. Saxagliptin is removed by hemodialysis. In subjects with hepatic impairment (Child-Pugh classes A, B, and C), mean Cmax and AUC of saxagliptin were up to 8% and 77% higher, respectively, compared to healthy matched controls following administration of a single 10 mg dose of saxagliptin. The corresponding Cmax and AUC of the active metabolite were up to 59% and 33% lower, respectively, compared to healthy matched controls. These differences are not considered to be clinically meaningful. No dosage adjustment is recommended for patients with hepatic impairment. No dosage adjustment is recommended based on body mass index (BMI) which was not identified as a significant covariate on the apparent clearance of saxagliptin or its active metabolite in the population pharmacokinetic analysis. No dosage adjustment is recommended based on gender. There were no differences observed in saxagliptin pharmacokinetics between males and females. Compared to males, females had approximately 25% higher exposure values for the active metabolite than males, but this difference is unlikely to be of clinical relevance. Gender was not identified as a significant covariate on the apparent clearance of saxagliptin and its active metabolite in the population pharmacokinetic analysis. No dosage adjustment is recommended based on age alone. Elderly subjects (65-80 years) had 23% and 59% higher geometric mean Cmax and geometric mean AUC values, respectively, for saxagliptin than young subjects (18-40 years). Differences in active metabolite pharmacokinetics between elderly and young subjects generally reflected the differences observed in saxagliptin pharmacokinetics. The difference between the pharmacokinetics of saxagliptin and the active metabolite in young and elderly subjects is likely due to multiple factors including declining renal function and metabolic capacity with increasing age. Age was not identified as a significant covariate on the apparent clearance of saxagliptin and its active metabolite in the population pharmacokinetic analysis. Studies characterizing the pharmacokinetics of saxagliptin in pediatric patients have not been performed. No dosage adjustment is recommended based on race. The population pharmacokinetic analysis compared the pharmacokinetics of saxagliptin and its active metabolite in 309 Caucasian subjects with 105 non-Caucasian subjects (consisting of six racial groups). No significant difference in the pharmacokinetics of saxagliptin and its active metabolite were detected between these two populations. The metabolism of saxagliptin is primarily mediated by CYP3A4/5. In in vitro studies, saxagliptin and its active metabolite did not inhibit CYP1A2, 2A6, 2B6, 2C9, 2C19, 2D6, 2E1, or 3A4, or induce CYP1A2, 2B6, 2C9, or 3A4. Therefore, saxagliptin is not expected to alter the metabolic clearance of coadministered drugs that are metabolized by these enzymes. Saxagliptin is a P-glycoprotein (P-gp) substrate but is not a significant inhibitor or inducer of P-gp. § The plasma dipeptidyl peptidase-4 (DPP4) activity inhibition over a 24-hour dose interval was not affected by rifampin. Saxagliptin did not induce tumors in either mice (50, 250, and 600 mg/kg) or rats (25, 75, 150, and 300 mg/kg) at the highest doses evaluated. The highest doses evaluated in mice were equivalent to approximately 870 (males) and 1165 (females) times the human exposure at the MRHD of 5 mg/day. In rats, exposures were approximately 355 (males) and 2217 (females) times the MRHD. 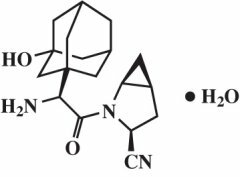 Saxagliptin was not mutagenic or clastogenic with or without metabolic activation in an in vitro Ames bacterial assay, an in vitro cytogenetics assay in primary human lymphocytes, an in vivo oral micronucleus assay in rats, an in vivo oral DNA repair study in rats, and an oral in vivo/in vitro cytogenetics study in rat peripheral blood lymphocytes. The active metabolite was not mutagenic in an in vitro Ames bacterial assay. In a rat fertility study, males were treated with oral gavage doses for 2 weeks prior to mating, during mating, and up to scheduled termination (approximately 4 weeks total) and females were treated with oral gavage doses for 2 weeks prior to mating through gestation day 7. No adverse effects on fertility were observed at exposures of approximately 603 (males) and 776 (females) times the MRHD. Higher doses that elicited maternal toxicity also increased fetal resorptions (approximately 2069 and 6138 times the MRHD). Additional effects on estrous cycling, fertility, ovulation, and implantation were observed at approximately 6138 times the MRHD. Saxagliptin produced adverse skin changes in the extremities of cynomolgus monkeys (scabs and/or ulceration of tail, digits, scrotum, and/or nose). Skin lesions were reversible at â‰¥20 times the MRHD but in some cases were irreversible and necrotizing at higher exposures. Adverse skin changes were not observed at exposures similar to (1 to 3 times) the MRHD of 5 mg. Clinical correlates to skin lesions in monkeys have not been observed in human clinical trials of saxagliptin. ONGLYZA has been studied as monotherapy and in combination with metformin, glyburide, and thiazolidinedione (pioglitazone and rosiglitazone) therapy. A total of 4148 patients with type 2 diabetes mellitus were randomized in six, double-blind, controlled clinical trials conducted to evaluate the safety and glycemic efficacy of ONGLYZA. A total of 3021 patients in these trials were treated with ONGLYZA. In these trials, the mean age was 54 years, and 71% of patients were Caucasian, 16% were Asian, 4% were black, and 9% were of other racial groups. An additional 423 patients, including 315 who received ONGLYZA, participated in a placebo-controlled, dose-ranging study of 6 to 12 weeks in duration. In these six, double-blind trials, ONGLYZA was evaluated at doses of 2.5 mg and 5 mg once daily. Three of these trials also evaluated a saxagliptin dose of 10 mg daily. The 10 mg daily dose of saxagliptin did not provide greater efficacy than the 5 mg daily dose. Treatment with ONGLYZA at all doses produced clinically relevant and statistically significant improvements in hemoglobin A1c (A1C), fasting plasma glucose (FPG), and 2-hour postprandial glucose (PPG) following a standard oral glucose tolerance test (OGTT), compared to control. Reductions in A1C were seen across subgroups including gender, age, race, and baseline BMI. ONGLYZA was not associated with significant changes from baseline in body weight or fasting serum lipids compared to placebo. ONGLYZA has also been evaluated in three additional trials in patients with type 2 diabetes: an active-controlled trial comparing add-on therapy with ONGLYZA to glipizide in 858 patients inadequately controlled on metformin alone, a trial comparing ONGLYZA to placebo in 455 patients inadequately controlled on insulin alone or on insulin in combination with metformin, and a trial comparing ONGLYZA to placebo in 170 patients with type 2 diabetes and moderate or severe renal impairment or ESRD. A total of 766 patients with type 2 diabetes inadequately controlled on diet and exercise (A1C â‰¥7% to â‰¤10%) participated in two 24-week, double-blind, placebo-controlled trials evaluating the efficacy and safety of ONGLYZA monotherapy. In the first trial, following a 2-week single-blind diet, exercise, and placebo lead-in period, 401 patients were randomized to 2.5 mg, 5 mg, or 10 mg of ONGLYZA or placebo. Patients who failed to meet specific glycemic goals during the study were treated with metformin rescue therapy, added on to placebo or ONGLYZA. Efficacy was evaluated at the last measurement prior to rescue therapy for patients needing rescue. Dose titration of ONGLYZA was not permitted. Treatment with ONGLYZA 2.5 mg and 5 mg daily provided significant improvements in A1C, FPG, and PPG compared to placebo (Table 5). The percentage of patients who discontinued for lack of glycemic control or who were rescued for meeting prespecified glycemic criteria was 16% in the ONGLYZA 2.5 mg treatment group, 20% in the ONGLYZA 5 mg treatment group, and 26% in the placebo group. * Intent-to-treat population using last observation on study or last observation prior to metformin rescue therapy for patients needing rescue. â€ Least squares mean adjusted for baseline value. ¶ Significance was not tested for the 2-hour PPG for the 2.5 mg dose of ONGLYZA. A second 24-week monotherapy trial was conducted to assess a range of dosing regimens for ONGLYZA. Treatment-naive patients with inadequately controlled diabetes (A1C â‰¥7% to â‰¤10%) underwent a 2-week, single-blind diet, exercise, and placebo lead-in period. A total of 365 patients were randomized to 2.5 mg every morning, 5 mg every morning, 2.5 mg with possible titration to 5 mg every morning, or 5 mg every evening of ONGLYZA, or placebo. Patients who failed to meet specific glycemic goals during the study were treated with metformin rescue therapy added on to placebo or ONGLYZA; the number of patients randomized per treatment group ranged from 71 to 74. Treatment with either ONGLYZA 5 mg every morning or 5 mg every evening provided significant improvements in A1C versus placebo (mean placebo-corrected reductions of âˆ’0.4% and âˆ’0.3%, respectively). Treatment with ONGLYZA 2.5 mg every morning also provided significant improvement in A1C versus placebo (mean placebo-corrected reduction of âˆ’0.4%). A total of 743 patients with type 2 diabetes participated in this 24-week, randomized, double-blind, placebo-controlled trial to evaluate the efficacy and safety of ONGLYZA in combination with metformin in patients with inadequate glycemic control (A1C â‰¥7% and â‰¤10%) on metformin alone. To qualify for enrollment, patients were required to be on a stable dose of metformin (1500-2550 mg daily) for at least 8 weeks. Patients who met eligibility criteria were enrolled in a single-blind, 2-week, dietary and exercise placebo lead-in period during which patients received metformin at their pre-study dose, up to 2500 mg daily. Following the lead-in period, eligible patients were randomized to 2.5 mg, 5 mg, or 10 mg of ONGLYZA or placebo in addition to their current dose of open-label metformin. Patients who failed to meet specific glycemic goals during the study were treated with pioglitazone rescue therapy, added on to existing study medications. Dose titrations of ONGLYZA and metformin were not permitted. ONGLYZA 2.5 mg and 5 mg add-on to metformin provided significant improvements in A1C, FPG, and PPG compared with placebo add-on to metformin (Table 6). Mean changes from baseline for A1C over time and at endpoint are shown in Figure 1. The proportion of patients who discontinued for lack of glycemic control or who were rescued for meeting prespecified glycemic criteria was 15% in the ONGLYZA 2.5 mg add-on to metformin group, 13% in the ONGLYZA 5 mg add-on to metformin group, and 27% in the placebo add-on to metformin group. * Intent-to-treat population using last observation on study or last observation prior to pioglitazone rescue therapy for patients needing rescue. * Includes patients with a baseline and week 24 value. Week 24 (LOCF) includes intent-to-treat population using last observation on study prior to pioglitazone rescue therapy for patients needing rescue. Mean change from baseline is adjusted for baseline value. A total of 565 patients with type 2 diabetes participated in this 24-week, randomized, double-blind, placebo-controlled trial to evaluate the efficacy and safety of ONGLYZA in combination with a thiazolidinedione (TZD) in patients with inadequate glycemic control (A1C â‰¥7% to â‰¤10.5%) on TZD alone. 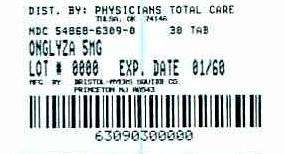 To qualify for enrollment, patients were required to be on a stable dose of pioglitazone (30-45 mg once daily) or rosiglitazone (4 mg once daily or 8 mg either once daily or in two divided doses of 4 mg) for at least 12 weeks. Patients who met eligibility criteria were enrolled in a single-blind, 2-week, dietary and exercise placebo lead-in period during which patients received TZD at their pre-study dose. Following the lead-in period, eligible patients were randomized to 2.5 mg or 5 mg of ONGLYZA or placebo in addition to their current dose of TZD. Patients who failed to meet specific glycemic goals during the study were treated with metformin rescue, added on to existing study medications. Dose titration of ONGLYZA or TZD was not permitted during the study. A change in TZD regimen from rosiglitazone to pioglitazone at specified, equivalent therapeutic doses was permitted at the investigatorâ€™s discretion if believed to be medically appropriate. ONGLYZA 2.5 mg and 5 mg add-on to TZD provided significant improvements in A1C, FPG, and PPG compared with placebo add-on to TZD (Table 7). The proportion of patients who discontinued for lack of glycemic control or who were rescued for meeting prespecified glycemic criteria was 10% in the ONGLYZA 2.5 mg add-on to TZD group, 6% for the ONGLYZA 5 mg add-on to TZD group, and 10% in the placebo add-on to TZD group. A total of 768 patients with type 2 diabetes participated in this 24-week, randomized, double-blind, placebo-controlled trial to evaluate the efficacy and safety of ONGLYZA in combination with a sulfonylurea (SU) in patients with inadequate glycemic control at enrollment (A1C â‰¥7.5% to â‰¤10%) on a submaximal dose of SU alone. To qualify for enrollment, patients were required to be on a submaximal dose of SU for 2 months or greater. In this study, ONGLYZA in combination with a fixed, intermediate dose of SU was compared to titration to a higher dose of SU. Patients who met eligibility criteria were enrolled in a single-blind, 4-week, dietary and exercise lead-in period, and placed on glyburide 7.5 mg once daily. Following the lead-in period, eligible patients with A1C â‰¥7% to â‰¤10% were randomized to either 2.5 mg or 5 mg of ONGLYZA add-on to 7.5 mg glyburide or to placebo plus a 10 mg total daily dose of glyburide. Patients who received placebo were eligible to have glyburide up-titrated to a total daily dose of 15 mg. Up-titration of glyburide was not permitted in patients who received ONGLYZA 2.5 mg or 5 mg. Glyburide could be down-titrated in any treatment group once during the 24-week study period due to hypoglycemia as deemed necessary by the investigator. Approximately 92% of patients in the placebo plus glyburide group were up-titrated to a final total daily dose of 15 mg during the first 4 weeks of the study period. Patients who failed to meet specific glycemic goals during the study were treated with metformin rescue, added on to existing study medication. Dose titration of ONGLYZA was not permitted during the study. In combination with glyburide, ONGLYZA 2.5 mg and 5 mg provided significant improvements in A1C, FPG, and PPG compared with the placebo plus up-titrated glyburide group (Table 8). The proportion of patients who discontinued for lack of glycemic control or who were rescued for meeting prespecified glycemic criteria was 18% in the ONGLYZA 2.5 mg add-on to glyburide group, 17% in the ONGLYZA 5 mg add-on to glyburide group, and 30% in the placebo plus up-titrated glyburide group. A total of 1306 treatment-naive patients with type 2 diabetes mellitus participated in this 24-week, randomized, double-blind, active-controlled trial to evaluate the efficacy and safety of ONGLYZA coadministered with metformin in patients with inadequate glycemic control (A1C â‰¥8% to â‰¤12%) on diet and exercise alone. Patients were required to be treatment-naive to be enrolled in this study. Patients who met eligibility criteria were enrolled in a single-blind, 1-week, dietary and exercise placebo lead-in period. Patients were randomized to one of four treatment arms: ONGLYZA 5 mg + metformin 500 mg, saxagliptin 10 mg + metformin 500 mg, saxagliptin 10 mg + placebo, or metformin 500 mg + placebo. ONGLYZA was dosed once daily. In the 3 treatment groups using metformin, the metformin dose was up-titrated weekly in 500 mg per day increments, as tolerated, to a maximum of 2000 mg per day based on FPG. Patients who failed to meet specific glycemic goals during the studies were treated with pioglitazone rescue as add-on therapy. Coadministration of ONGLYZA 5 mg plus metformin provided significant improvements in A1C, FPG, and PPG compared with placebo plus metformin (Table 9). In this 52-week, active-controlled trial, a total of 858 patients with type 2 diabetes and inadequate glycemic control (A1C >6.5% and â‰¤10%) on metformin alone were randomized to double-blind add-on therapy with ONGLYZA or glipizide. Patients were required to be on a stable dose of metformin (at least 1500 mg daily) for at least 8 weeks prior to enrollment. Patients who met eligibility criteria were enrolled in a single-blind, 2-week, dietary and exercise placebo lead-in period during which patients received metformin (1500-3000 mg based on their pre-study dose). Following the lead-in period, eligible patients were randomized to 5 mg of ONGLYZA or 5 mg of glipizide in addition to their current dose of open-label metformin. Patients in the glipizide plus metformin group underwent blinded titration of the glipizide dose during the first 18 weeks of the trial up to a maximum glipizide dose of 20 mg per day. Titration was based on a goal FPG â‰¤110 mg/dL or the highest tolerable glipizide dose. Fifty percent (50%) of the glipizide-treated patients were titrated to the 20-mg daily dose; 21% of the glipizide-treated patients had a final daily glipizide dose of 5 mg or less. The mean final daily dose of glipizide was 15 mg.
After 52 weeks of treatment, ONGLYZA and glipizide resulted in similar mean reductions from baseline in A1C when added to metformin therapy (Table 10). This conclusion may be limited to patients with baseline A1C comparable to those in the trial (91% of patients had baseline A1C <9%). From a baseline mean body weight of 89 kg, there was a statistically significant mean reduction of 1.1 kg in patients treated with ONGLYZA compared to a mean weight gain of 1.1 kg in patients treated with glipizide (p<0.0001). â€¡ Saxagliptin + metformin is considered non-inferior to glipizide + metformin because the upper limit of this confidence interval is less than the prespecified non-inferiority margin of 0.35%. A total of 455 patients with type 2 diabetes participated in this 24-week, randomized, double-blind, placebo-controlled trial to evaluate the efficacy and safety of ONGLYZA in combination with insulin in patients with inadequate glycemic control (A1C â‰¥7.5% and â‰¤11%) on insulin alone (N=141) or on insulin in combination with a stable dose of metformin (N=314). Patients were required to be on a stable dose of insulin (â‰¥30 units to â‰¤150 units daily) with â‰¤20% variation in total daily dose for â‰¥8 weeks prior to screening. Patients entered the trial on intermediate- or long-acting (basal) insulin or premixed insulin. Patients using short-acting insulins were excluded unless the short-acting insulin was administered as part of a premixed insulin. Patients who met eligibility criteria were enrolled in a single-blind, four-week, dietary and exercise placebo lead-in period during which patients received insulin (and metformin if applicable) at their pretrial dose(s). Following the lead-in period, eligible patients were randomized to add-on therapy with either ONGLYZA 5 mg or placebo. Doses of the antidiabetic therapies were to remain stable but patients were rescued and allowed to adjust the insulin regimen if specific glycemic goals were not met or if the investigator learned that the patient had self-increased the insulin dose by >20%. Data after rescue were excluded from the primary efficacy analyses. Add-on therapy with ONGLYZA 5 mg provided significant improvements from baseline to Week 24 in A1C and PPG compared with add-on placebo (Table 11). Similar mean reductions in A1C versus placebo were observed for patients using ONGLYZA 5 mg add-on to insulin alone and ONGLYZA 5 mg add-on to insulin in combination with metformin (âˆ’0.4% and âˆ’0.4%, respectively). The percentage of patients who discontinued for lack of glycemic control or who were rescued was 23% in the ONGLYZA group and 32% in the placebo group. The mean daily insulin dose at baseline was 53 units in patients treated with ONGLYZA 5 mg and 55 units in patients treated with placebo. The mean change from baseline in daily dose of insulin was 2 units for the ONGLYZA 5 mg group and 5 units for the placebo group. * Intent-to-treat population using last observation on study or last observation prior to insulin rescue therapy for patients needing rescue. â€ Least squares mean adjusted for baseline value and metformin use at baseline. A total of 170 patients participated in a 12-week, randomized, double-blind, placebo-controlled trial conducted to evaluate the efficacy and safety of ONGLYZA 2.5 mg once daily compared with placebo in patients with type 2 diabetes and moderate (n=90) or severe (n=41) renal impairment or ESRD (n=39). In this trial, 98% of the patients were using background antidiabetic medications (75% were using insulin and 31% were using oral antidiabetic medications, mostly sulfonylureas). 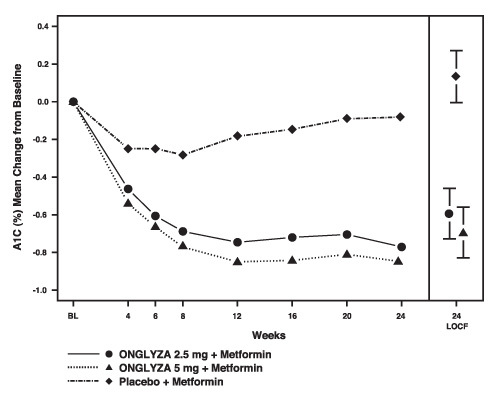 After 12 weeks of treatment, ONGLYZA 2.5 mg provided significant improvement in A1C compared to placebo (Table 12). In the subgroup of patients with ESRD, ONGLYZA and placebo resulted in comparable reductions in A1C from baseline to Week 12. This finding is inconclusive because the trial was not adequately powered to show efficacy within specific subgroups of renal impairment. After 12 weeks of treatment, the mean change in FPG was âˆ’12 mg/dL with ONGLYZA 2.5 mg and âˆ’13 mg/dL with placebo. Compared to placebo, the mean change in FPG with ONGLYZA was âˆ’12 mg/dL in the subgroup of patients with moderate renal impairment, âˆ’4 mg/dL in the subgroup of patients with severe renal impairment, and +44 mg/dL in the subgroup of patients with ESRD. These findings are inconclusive because the trial was not adequately powered to show efficacy within specific subgroups of renal impairment. ONGLYZA® (saxagliptin) tablets have markings on both sides and are available in the strengths and packages listed in Table 12. Patients should be informed of the potential risks and benefits of ONGLYZA and of alternative modes of therapy. Patients should also be informed about the importance of adherence to dietary instructions, regular physical activity, periodic blood glucose monitoring and A1C testing, recognition and management of hypoglycemia and hyperglycemia, and assessment of diabetes complications. During periods of stress such as fever, trauma, infection, or surgery, medication requirements may change and patients should be advised to seek medical advice promptly. Patients should be informed that acute pancreatitis has been reported during postmarketing use of ONGLYZA. Before initiating ONGLYZA, patients should be questioned about other risk factors for pancreatitis, such as a history of pancreatitis, alcoholism, gallstones, or hypertriglyceridemia. Patients should also be informed that persistent severe abdominal pain, sometimes radiating to the back, which may or may not be accompanied by vomiting, is the hallmark symptom of acute pancreatitis. Patients should be instructed to promptly discontinue ONGLYZA and contact their healthcare provider if persistent severe abdominal pain occurs [see Warnings and Precautions (5.1)]. Patients should be informed that serious allergic (hypersensitivity) reactions, such as angioedema, anaphylaxis, and exfoliative skin conditions, have been reported during postmarketing use of ONGLYZA. If symptoms of these allergic reactions (such as rash, skin flaking or peeling, urticaria, swelling of the skin, or swelling of the face, lips, tongue, and throat that may cause difficulty in breathing or swallowing) occur, patients must stop taking ONGLYZA and seek medical advice promptly. Patients should be informed that if they miss a dose of ONGLYZA they should take the next dose as prescribed, unless otherwise instructed by their healthcare provider. Patients should be instructed not to take an extra dose the next day. Healthcare providers should instruct their patients to read the Medication Guide before starting ONGLYZA therapy and to reread it each time the prescription is renewed. Patients should be instructed to inform their healthcare provider if they develop any unusual symptom or if any existing symptom persists or worsens. Patients should be informed that ONGLYZA tablets must not be split or cut. Patients should be informed that response to all diabetic therapies should be monitored by periodic measurements of blood glucose and A1C, with a goal of decreasing these levels toward the normal range. A1C is especially useful for evaluating long-term glycemic control. Patients should be informed of the potential need to adjust their dose based on changes in renal function tests over time. Read this Medication Guide carefully before you start taking ONGLYZA and each time you get a refill. There may be new information. This information does not take the place of talking with your healthcare provider about your medical condition or treatment. If you have any questions about ONGLYZA, ask your healthcare provider. What is the most important information I should know about ONGLYZA? Serious side effects can happen to people taking ONGLYZA, including inflammation of the pancreas (pancreatitis) which may be severe and lead to death. Certain medical problems make you more likely to get pancreatitis. It is not known if having these medical problems will make you more likely to get pancreatitis with ONGLYZA. Stop taking ONGLYZA and contact your healthcare provider right away if you have pain in your stomach area (abdomen) that is severe and will not go away. The pain may be felt going from your abdomen through to your back. The pain may happen with or without vomiting. These may be symptoms of pancreatitis. ONGLYZA is a prescription medicine used with diet and exercise to control high blood sugar (hyperglycemia) in adults with type 2 diabetes. ONGLYZA lowers blood sugar by helping the body increase the level of insulin after meals. ONGLYZA is unlikely by itself to cause your blood sugar to be lowered to a dangerous level (hypoglycemia) because it does not work well when your blood sugar is low. However, hypoglycemia may still occur with ONGLYZA. Your risk for getting hypoglycemia is higher if you take ONGLYZA with some other diabetes medicines, such as a sulfonylurea or insulin. ONGLYZA is not for people with type 1 diabetes. ONGLYZA is not for people with diabetic ketoacidosis (increased ketones in your blood or urine). If you have had pancreatitis in the past, it is not known if you have a higher chance of getting pancreatitis while you take ONGLYZA. It is not known if ONGLYZA is safe and effective in children younger than 18 years old. are allergic to any ingredients in ONGLYZA. See the end of this Medication Guide for a complete list of ingredients in ONGLYZA. • If you have these symptoms, stop taking ONGLYZA and contact your healthcare provider right away. What should I tell my healthcare provider before taking ONGLYZA? are pregnant or plan to become pregnant. It is not known if ONGLYZA will harm your unborn baby. If you are pregnant, talk with your healthcare provider about the best way to control your blood sugar while you are pregnant. are breast-feeding or plan to breast-feed. ONGLYZA may be passed in your milk to your baby. Talk with your healthcare provider about the best way to feed your baby while you take ONGLYZA. ONGLYZA may affect the way other medicines work, and other medicines may affect how ONGLYZA works. Contact your healthcare provider if you will be starting or stopping certain other types of medications, such as antibiotics, or medicines that treat fungus or HIV/AIDS, because your dose of ONGLYZA might need to be changed. Take ONGLYZA by mouth one time each day exactly as directed by your healthcare provider. Do not change your dose without talking to your healthcare provider. ONGLYZA can be taken with or without food. Do not split or cut ONGLYZA tablets. • Contact your healthcare provider right away as your medication needs may change. Your healthcare provider should test your blood to measure how well your kidneys are working before and during your treatment with ONGLYZA. You may need a lower dose of ONGLYZA if your kidneys are not working well. Follow your healthcare providerâ€™s instructions for treating blood sugar that is too low (hypoglycemia). Talk to your healthcare provider if low blood sugar is a problem for you. If you miss a dose of ONGLYZA, take it as soon as you remember. If it is almost time for your next dose, skip the missed dose. Just take the next dose at your regular time. Do not take two doses at the same time unless your healthcare provider tells you to do so. Talk to your healthcare provider if you have questions about a missed dose. If you take too much ONGLYZA, call your healthcare provider or Poison Control Center at 1-800-222-1222, or go to the nearest hospital emergency room right away. See "What is the most important information I should know about ONGLYZA?" Swelling or fluid retention in your hands, feet, or ankles (peripheral edema) may become worse in people who also take a thiazolidinedione to treat diabetes. If you do not know whether you are already on this type of medication, ask your healthcare provider. These are not all of the possible side effects of ONGLYZA. Tell your healthcare provider if you have any side effects that bother you or that do not go away. For more information, ask your healthcare provider. Call your healthcare provider for medical advice about side effects. You may report side effects to the FDA at 1-800-FDA-1088. How should I store ONGLYZA? Store ONGLYZA between 68°F and 77°F (20°C and 25°C). Keep ONGLYZA and all medicines out of the reach of children. Medicines are sometimes prescribed for conditions that are not mentioned in Medication Guides. Do not use ONGLYZA for a condition for which it was not prescribed. Do not give ONGLYZA to other people, even if they have the same symptoms you have. It may harm them. This Medication Guide summarizes the most important information about ONGLYZA. If you would like to know more information about ONGLYZA, talk with your healthcare provider. You can ask your healthcare provider for additional information about ONGLYZA that is written for healthcare professionals. For more information, go to www.ONGLYZA.com or call 1-800-ONGLYZA. What are the ingredients of ONGLYZA? Inactive ingredients: lactose monohydrate, microcrystalline cellulose, croscarmellose sodium, and magnesium stearate. In addition, the film coating contains the following inactive ingredients: polyvinyl alcohol, polyethylene glycol, titanium dioxide, talc, and iron oxides. The main goal of treating diabetes is to lower your blood sugar so that it is as close to normal as possible. See How Supplied section for a complete list of available packages of ONGLYZA.